One of the reasons that I enjoy teaching middle school is that I have always felt that grading, specifically communicating achievement through report cards, are not the “high stakes” exercise that it is in high school; I have felt somewhat immune to the potential firestorms of “grades gone bad” of high school. Even Chappuis, Stiggins, Chappuis and Arter (2012) confess that “…of all the thing we do as teaches, few have the potential for creating more conflict and communication problems than grading” (p. 335) I thought that because middle school grades do not typically determine entrance to university, scholarship eligibility nor are reported to prospective employers, that they lacked the potential to harm. I thought, erroneously, that they just don’t count that much, at least not comparatively and that I was somehow inoculated from these types of conflicts. However, through the reading this week (and previous weeks) I have come to realize that there are sound guidelines that I can utilize to guide my assessment and hence, grading practices to ensure that unnecessary subjectivity is removed from the grading equation. I have also learned that grades at any level, do count. It seems that every year, I encounter a student that I feel like I just can’t through to. He or she has limitless potential, yet is a classic underachiever. Or perhaps, the opposite is true; the student that tries until the sun goes down, but still just doesn’t get it. In the past, I used grades to motivate these students, or to punish, in the case of unmotivated students. I can see how faulty this thinking was! I am reminded of these failures by Chappuis et al. (2012) statement that, “…no studies find that reducing grades as punishment increases efforts…lowering grades more often causes students to withdraw from further learning” (p. 337). I have to wonder how one of my students’ experiences last year would be different had I not “punished” his lack of effort with an F? In my future school, I will continue the same process of communication with parents, the student and administration that I always have, but I will consider suggestions by Chappuis et al. (2012) that I issue an incomplete (no basis for grade) rather than an F on reports, or I will not allow that student to take a summative assessment if their prior work is not complete. This puts the responsibility squarely back on the student, and communicates that other issues are getting in the way of achievement, that must be addressed. In my last school, we included a non-academic grade that was tracked and used as a percentage of students final grade; it was not reported separately from content-area achievement, so a students’ grade was inflated or deflated up to ten percent depending upon their timeliness, cooperation, work and study habits. While our readings have admonished this practice, there hasn’t been a clearly articulated substitute other than a somewhat vague statement to report these things separately from achievement. After listening to Dr. Williams podcast this week with an example of the grading report from the Tacoma school district, I was able to see a tangible means to report dispositions that I feel are important to student achievement, but aren’t necessarily appropriate to include in a language arts grade. The use of specific criteria with multiple indicators of meeting or not meeting standard for a variety of non-academic, yet I would argue influential to academic and life success, were reported. Clearly, this is something that would have to occur and be supported at the school-wide level but if it was, I believe that educators that believe in the importance of these dispositions would be supportive. I am less sure of how to logistically implement the final recommendation of only including recent achievement in the academic grade. I wonder how to deal with the logistics of including a large enough sampling size, my time at the end of the quarter, allowing the grading of late assessments and a myriad other factors too numerous to enumerate here that affect a final grade. I did find the practical suggestions regarding converting rubric scores to grades and the combination of these types of rating with other assessment information to be helpful. These are specifics that I will have to work-out when I am in a traditional classroom setting again, but what I can hold on to is Chappuis et al. (2012) holds to be true that “…it’s not where a students starts on a given learning target that matter, but where the student finishes” (p. 341). This is clearer to me with every chapter I read. This is an example of a refreshed, updated and revised Student Grading. I used the Grading Bill of Rights from chapter nine in the O’Connor (2009) as a model for my thinking. While I may continue to refine and rethink my philosophy, this represents the most current thinking on my part regarding grading philosophy. My grading practices have the power to wield either a positive or negative influence on my students learning; I had best get it right. While I can’t control everything that transpires in my school building, I do have the power to effect what happens in my room; this is where a conscious switch from using grades to reward or punish, and communicate irrelevant information can end. That’s the beauty of being able to exercise my own professional judgment as an educator. Chappuis, J., Stiggins, R., Chappuis, S., & Arter, J. (2012). Classroom assessment for student learning: Doing it right, using it well. Upper Saddle River, NJ: Pearson Education Inc.
O’Connor, Ken. (2009). 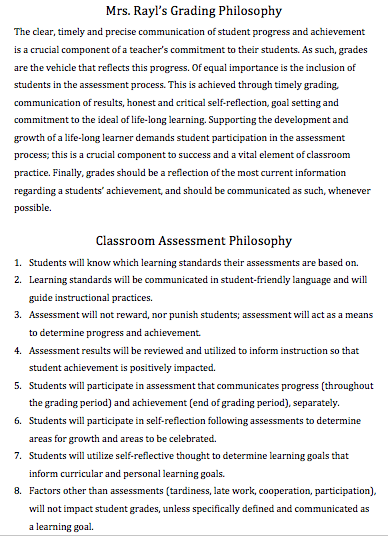 How To Grade for Learning, K-12. Thousand Oaks, CA: Corwin. This entry was posted in EDU 6613-Standards Based Assessment, Standard 05. Assessment and tagged assessment for learning, Assessment Philosophy, Grades, Grading Guidelines, grading policy, student self-assessment. Bookmark the permalink. It’s interesting to hear about your view of middle school in relation to the pressure packed topic of grading. I’d say that grading reform really needs attention in the US schools that I’ve been a part of. High schools, too, and this is a harder issue. Once teachers get the big ideas, it is hard to go backwards, though. I’ll bet that you’ll impact other teachers when you return to school. My guess is that middle school kids can learn more and achieve more when they understand how this works, and feel connected to fair grading practices.